I’m really trying my best to be a healthy snacker. I cut up carrots and cucumbers today, and managed to eat them (albeit at 9pm). However sometimes I just want something salty and crunchy, and my go to snack is usually chips or smartfood (both of which I seriously need to ban from my house – I literally have no control when it comes to these foods). 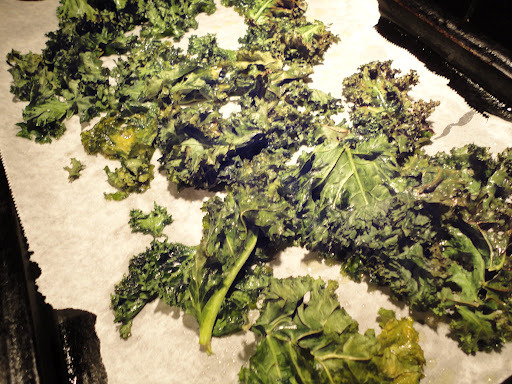 I had heard about kale chips before, but did not bother trying them until I was on the elimination diet – and I realized that I was really missing an amazing thing. These chips are so flavourful and crunchy, ah… I could just go on forever. 1. It’s packed full of vitamins & minerals, fibre, antioxidants, and omega-3 fatty acids –> Doesn’t it seem like a miracle food? Convinced to try kale out? Yes? Good! Pretty simple right? Have any suggestions for other healthy snacks? What about alternate kale recipes?